Samsung has announced all of their newest products at this year Samsung Unpacked. One of the devices unveiled includes one of Samsung’s most successful phones, the Galaxy S (S10, S10+, S10e, and S10 5G), on the 10th year anniversary of the device. 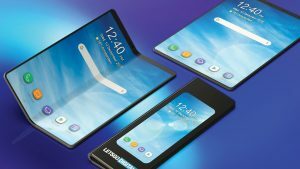 One of the first foldable smart phones in the world, the Galaxy Fold, was also unveiled. A few other products shown were, Galaxy watches and Galaxy Buds. The event was at the Bill Graham Civic Auditorium on Wednesday, February 20, in San Francisco, CA. 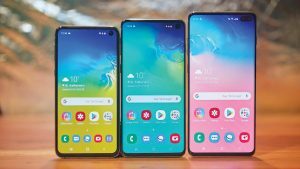 The new ranges of Galaxy S10s are the first phones with an Infinity-O display. The display is laser-cut with a precise hole for only the camera(s) to be visible. The S10 and S10 Plus both have triple-lens cameras for wide-angle, telephoto zoom, and variable aperture lenses. S10 and S10 Plus have an in-display fingerprint scanner — the first in Smartphone tech — that provides an extra layer of security. The S10e only has two rear lenses but with variable aperture main lens and a wide-angle lens, it is sure to take some very impressive pictures. The phones offer impressive battery life and the S10 Plus will even charge any other device with its wireless charging feature. Just when you thought you had enough, the 5G came in to shock. The Galaxy S10 5G is basically the S10 range… plus 10. The phone has a 6.7-inch display, 8GB of RAM and a 4,500-mAh battery. A fourth camera was added to the 5G as a Time-of-Flight sensor meaning the phone will be able to read 3D mapping! 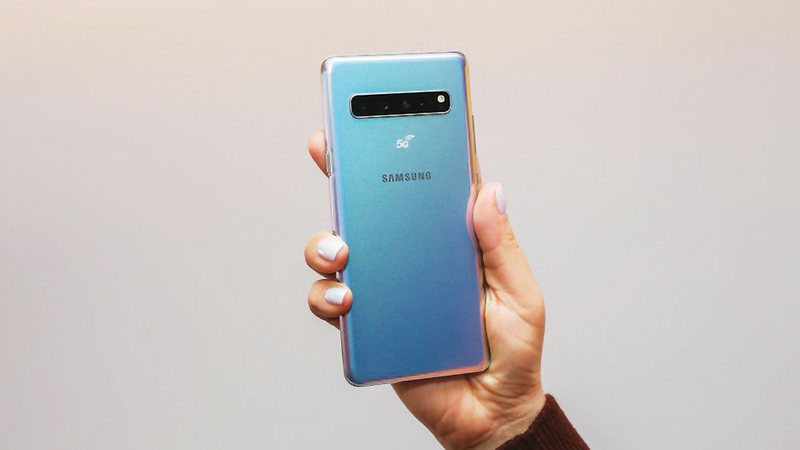 This phone is one of the first to be able to run on 5G Internet connections. Yes, 5G. It is the world’s newest and fastest mobile Internet connection. Although it is still in its early stages, expect the connection to shine. The 5G won’t be available until later this year unlike the other devices and is expected to be well over $1,000. It’s worth the wait! One of Samsungs most anticipated phones were announced: the Galaxy Fold. The Galaxy Fold offers a variety of features that you probably will not be able to find anywhere else except maybe on a laptop or professional camera. For starters, it folds! The phone has a 4.6-inch display when folded and 7.3 inches unfolded, both infinity displays. With six built in cameras; three on the back, two inside, and one on the front, the camera features allow you to shoot video and images with an array of features that only professional cameras have. 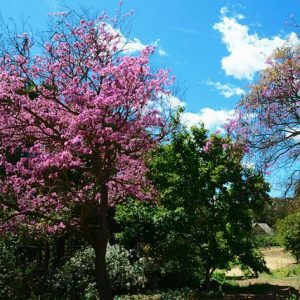 The three back cameras give you the ability to shoot in different depths and lengths that no other phone allows. 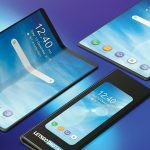 When you’re using an app with the phone folded you will be able to unfold the phone and continue where you left off; you can also run three apps at once when unfolded. The phone will be available April 26 and pricing starts at $1,980. Samsung introduced two new fitness-focused wearables. 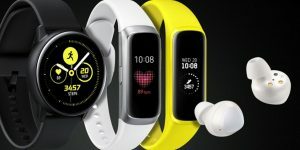 The Galaxy Watch Active is an updated version of Samsungs active watches; the most impressive update is the blood pressure feature. The Watch Active is Samsung’s first wearable device that will be able to track your blood pressure. The Watch Fit has a fitness band that looks like Samsung’s older styles. The Watch Fit will be able to track a variety of exercises running on Samsung’s Tizen operating system. 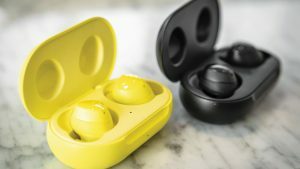 Samsung did not release an updated version to their 2018 Gear IconX wireless ear buds, but they did create a new set of ear buds. The Galaxy Buds come with a case that will allow you to charge them wirelessly, and you can also use your brand new Galaxy S10 to charge them! They don’t offer many features but for the price of $128 they are a good buy.